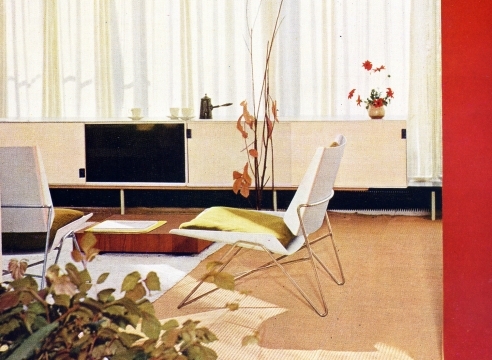 The designer-decorator duo of Janine Abraham and Dirk Jan Rol met at Jacques Dumond's studio in 1955. The couple shared the same love of precision, line and plain colors. Their earliest joint creations were first exhibited at the Salon des artistes décorateurs, in Paris. Their furniture, made of wicker, wood and aluminum, twice won prizes at the Salon des artistes décorateurs (a sideboard in 1956 and an armchair in 1958), garnering notice from the public and professionals alike. Jean Royère did not hesitate to use their emblematic Soleil armchair (gold medal at the 1958 Brussels World's Fair) in the decoration of the palace of the shah of Iran, in Teheran. Their light and functional designs are available today, re-edited by Yota Design. 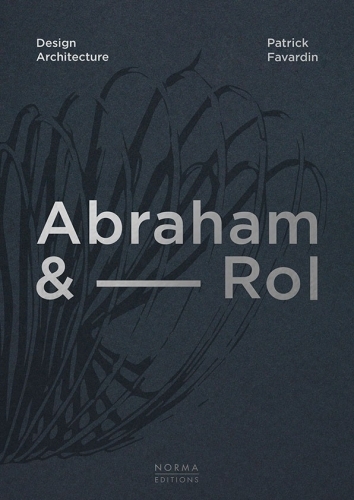 Abraham & Rol were also interior designers for both individual and large corporate clients, such as Yves Rocher and Saint-Gobain, with the same precision and sense of composition that define their furniture pieces. The couple also expressed their creativity through architecture, their mastery of this discipline enabling them to design some twenty houses from the 1960s through the 2000s in the Île-de-France region. Their homes are genuine inhabited sculptures, of which certain have become truly emblematic.